Pictured is the blue, white in the middle, and pink on the right. 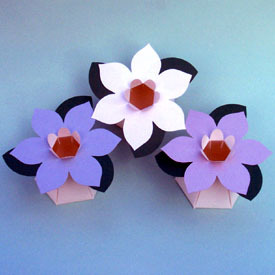 It is not too much to say about these blooming favor boxes. A picture is worth a thousand words in this case. The blooming favor boxes are beautiful and fabulous! They are iridescent and shimmer in sunlight and evening candlelight. Packaged in sets of 12. Therefore when you order "1", you will be getting 12 individual blooming favor boxes in that 1 set. February, May, and August are peak months for these boxes and may require a 2-6 week lead time. Other months are up to 2 weeks. In-Stock levels vary. The pink is more of a mauve than a light pink.